2) MORI SEIKI MV-55/50 CNC VMC, CT-50 FANUC 10M, 30 ATC, S/N 1242, 1027.MMK TEC 4th AXIS ROTARY TABLE. 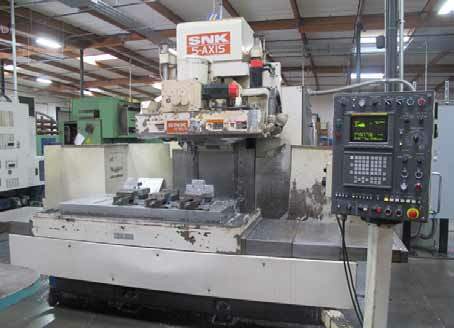 1986 KURAKI DV-2000 CNC VMC, CT-50, FANUC 11M CONTROL, 24 ATC, S/N 2415. TSUDAKOMA 4th AXIS ROTARY TABLE FOR KURAKI. 1986 ACCUPRESS 7606, 6FT X 60 TON HYD CNC PRESS BRAKE W/DYNABEND I CONTROL. STARTRITE 316F, 36” VERTICAL BAND SAW WITH WELDER. ELLIS MODEL 2000 HORZONTAL BAND SAW. 6) BRIDGEPORT VERTICAL MILLS WITH DRO AND P.F. LAGUN VERTICAL MILL MODEL FTV-2 VAR SPEED. BOYAR SCHULZ 618 MICROMASTER SURFACE GRINDER. CUTTERMASTER MODEL 5C END MILL SHARPENER. AUTOMATED FINISHING 48” VIBRATORY TUMBLER. END MILLS, CUTTERS, HOLDER, GAGES, TOOL CABINETS, LISTA CABINETS, ETC. SUNNEN PG-700S AND PG-800S GAGES. ST OPTIC 30” COMPARTOR WITH DRO. ROCKWELL 3 YR HARDNESS TESTER, S/N 461. FEDERAL 350 CMM WITH RENISHAW PROBE. 2) IR SSR ROTARY AIR COMPRESSORS WITH ZEKS DRYER AND TANKS. LARGE SELECTION OF MATERIAL, RACKING AND SUPPORT. OBER 20 KURT AND CHIC VISES, ROTARY TABLES, AND SUPPORT. 1994 CHEVY 3500 12 FT STAKE BED TRUCK.